A professionally installed air conditioning system should work quietly in the background, without you even realising it’s there. But what if there’s a problem? How quickly can your system be repaired? With Rayvac Airtemp Ltd, you don’t need to worry. We are fully Refcom certified and are experts in HVAC air conditioning repair. Your call is answered by one of our helpful customer service advisors, who can dispatch a trained engineer to be with you within twenty-four hours of your call. 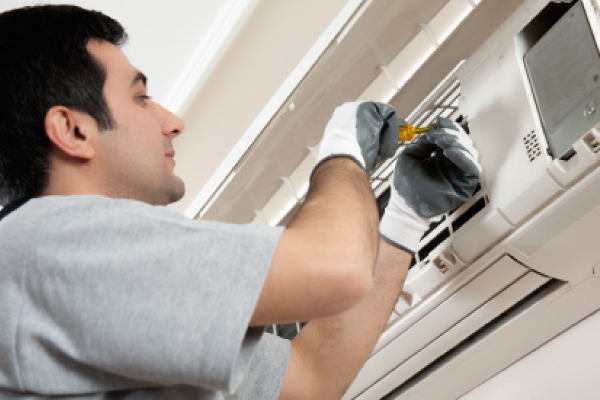 Once onsite, our air conditioning repair service engineers are able to diagnose faults quickly. Unit downtime is minimised, so your perfectly conditioned environment can be restored. We diagnose and fix all kinds of problems, including water leaks, fault light signals, display faults, unusual smells and complete system failure. For major works, such as a compressor change, we can even guarantee the work for twelve months. Can you fix my unit now? Fifty per cent of air-con repairs are completed on the first visit and ninety per cent of cases are fixed upon return visits. We always carry spare parts on our vans, so we can find a solution for your unit without having to visit a supplier. What qualifications / standards do your staff have? What types of unit can you repair? As a fully qualified air-con and refrigeration maintenance company, we can maintain any air conditioning equipment, water chillers, split units, VRV/VRF systems & refrigeration equipment. What maintenance is carried out? Cleaning of the condenser coil. Anti-bacterial cleaning of the indoor coil, cleaning of indoor Air filters. We are able to provide air conditioning maintenance to London and Essex based businesses. If you are outside this area, please call us to check availability. Our call-out fees start at £77.00, which includes the first hour on-site. What types of premises can you repair A/C in? Offices, schools, industrial site, restaurants, commercial units, shops & domestic. Even if you need an engineer at the weekend, it’s not a problem. Our engineers can be called out seven days a week, 8am – 5pm, including Saturday and Sunday. If you didn’t find the answer you were looking for then use the contact information below or our contact form! Remember – any air con problems you have right now could be fixed by this time tomorrow. Pick up the phone and speak to one of our advisors today about how quickly you can get your air conditioning unit back to full functionality.